Music is an important part in people’s life in the modern age. No matter you are young or you are old, a life without music is a terrible thing to imagine. From recorder to digital, the form of music keeps evolving in the last few decades to provide us better and better listening experience. If you are a music enthusiast, you must be familiar with lossless music formats, FLAC, for example, is one of the most famous formats for lossless music. It’s not hard to play FLAC on a portable player, like iPod or an MP3, but if you want to play FLAC in Windows Media Player, things are going to be a little tricky. Although being able to play most audio files, Windows Media Player cannot play FLAC directly as other music player. So how to play FLAC in Windows Media Player? We will find out soon. So what is FLAC files anyway? Well, the term FLAC stands for “Free Lossless Audio Codec”, basically it is an audio format that is similar to MP3, but comparing to MP3, FLAC is lossless, and that means that audio compressed in FLAC is without any loss in quality. Being similar to how Zip works, with FLAC you will get much better compression because FLAC is designed specifically for audio, and you can play back compressed FLAC files in most of your favorite player, your car or home stereo. Being the fastest and most widely supported lossless audio codec, FLAC is the only one that at once is non-proprietary, is unencumbered by patents, has an open-source reference implementation, has a well-documented format and API, and has several other independent implementations. That’s why FLAC is so popular and widely used for lossless music compression. Now that we know about what FLAC is, how do we play FLAC in Windows Media Player then? Well, as we said earlier, Windows Media Player cannot play FLAC directly, however, FLAC can be played by Windows Media Player if you install the proper FLAC codec Windows Media Player. If you don’t know about Windows Media Player codec yet, well, the word Codec is a portmanteau of ‘compressor-decompressor’. So generally speaking, a codec is a piece of software on either a device or computer that is capable of encoding or decoding video and audio data from files or streams. So how to install FLAC codec Windows Media Player? And how to play FLAC in Windows Media Player? Follow the steps below. Step 1: Download Media Player Codec Pack. Step 2: Close Windows Media Player if it’s running, and then open the Media Player Codec Pack setup file. Step 3: Choose Detailed Installation on the first screen of the installer, Click “Next”, Read the end-user license agreement (EULA) and then click the “I Agree” button. Step 4: On the “Choose Components” screen there is a list of codecs that are automatically selected for installation. If you want full support of all the formats provided, it’s best to leave these default selections. However, if you’re only interested in installing audio codecs, you can deselect other options. Step 5: Click “Next”. 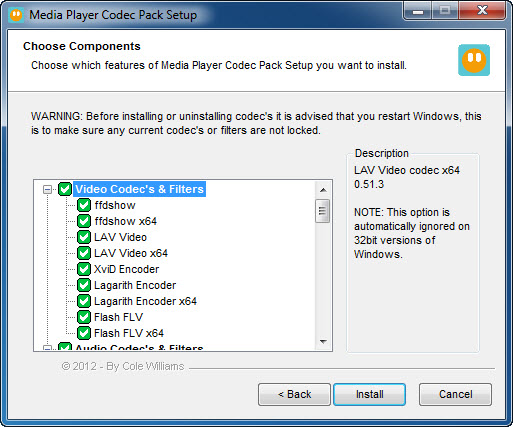 Like a lot of free software, Media Player Codec Pack comes with a potentially unwanted program. To avoid installing this extra software, remove the check in the box on the “Install Additional Software” screen. When the installation is finished, you are good to go. Installing codec pack can make your Windows Media Player able to play FLAC files and some other media files that weren’t supported earlier. To be honest, it’s not hard to do. But it is indeed a little bit troubling. Because every time you want to play a file that is not supported by Windows Media Player, you have to find the codec pack to download. And before downloading, you have to make sure you are about to download the pack for your system version. Because a wrong version of codec pack for your system won’t work properly. So, is there an easier way to do this? Of course there is. Instead of keep using Windows Media Player, it’s suggested you use another media player program as a replacement of Windows Media Player. Leawo Blu-ray Player for example, is one of the best. Leawo Blu-ray Player is a free media player that fully supports almost all kinds of video and audio file you can get, including FLAC, of course. Leawo Blu-ray player can play those video or audio files without any quality loss and retain the best quality. What’s more, as its name suggests, Leawo Blu-ray Player can play all kinds or Blu-ray or DVD disc, folder or ISO files, also without quality loss. Unlike Windows Media Player, for which you have to install extra codecs to add formats support, all the video and audio support are built-in so that you can directly play any media file you want with one click. When it comes to playing FLAC files, Windows Media Player with extra codec pack is not always the best solution. Sometimes you just need to install a third-party media player program that is powerful enough to play all of the formats you need and solve the problem once and for all. 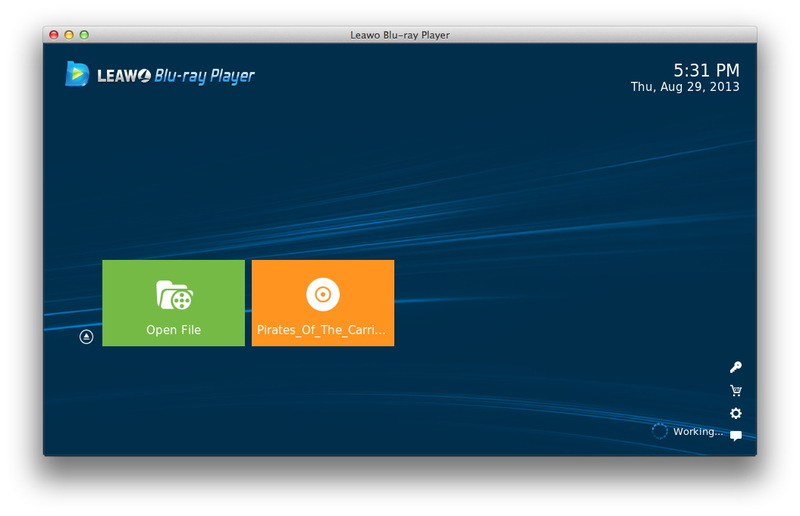 Leawo Blu-ray Player is free, so, why not give it a try?